Queens Museum, 2014. Photo by David Sundberg, Esto. In November 2013, the Queens Museum ushered in a new phase in the institution’s history, completing an expansion project that gives New York a spectacular new art venue, and provides the Museum with the space necessary to better serve its diverse communities. Since the Museum’s founding in 1972, there had been an underlying goal of occupying the entirety of the New York City Building, and now, with the design insight of Grimshaw Architects, the new Queens Museum has realized that ambition, doubling in size to 105,000 square feet, and been transformed into a nexus where the art world and real world can engage in open, meaningful dialogue. 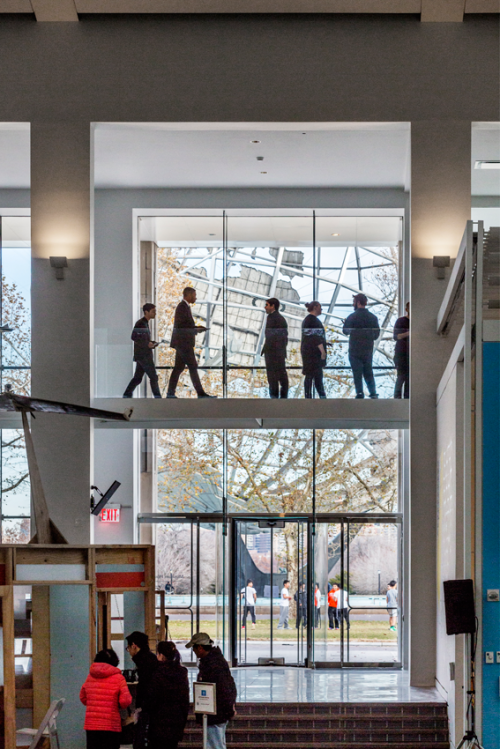 In conceiving of the design for the new space, the Museum’s aspirations were clear: a building that embodies the overarching philosophy of openness, integrating with Flushing Meadows Corona Park on the east and appearing vibrant and inviting from the Grand Central Parkway on the west. 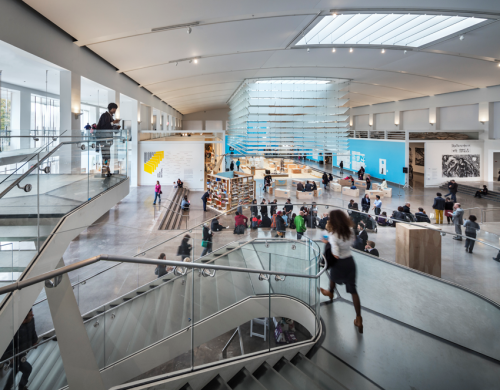 The interior should provide room for the display and care of growing permanent collections, spacious galleries for temporary exhibitions, and flexible and welcoming educational and public programming spaces to serve the Museum’s myriad communities. 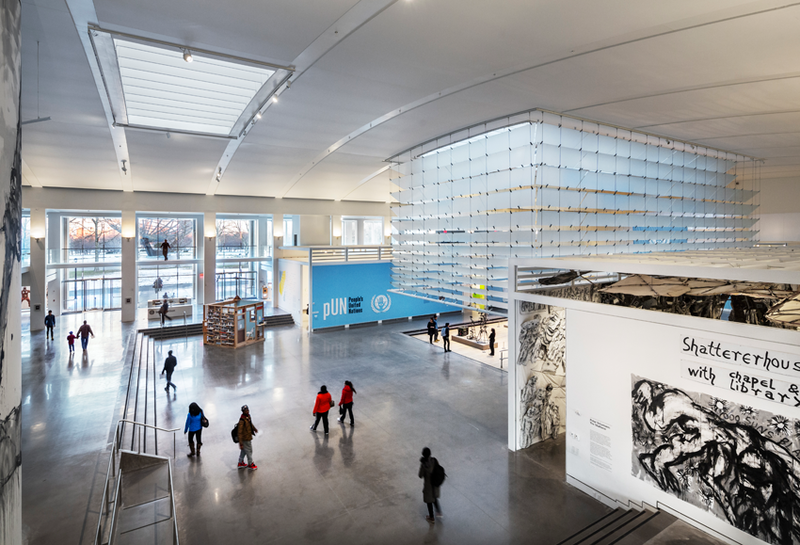 With daylight streaming into the new Museum through a series of skylights, and with soaring 48 foot ceilings, the entire space rings with an airiness that fits in well with its setting in a park. A suite of six galleries, ranging from 800 to 2,400 square feet, allows for concurrent exhibitions of different scales and flexible curatorial choices. The galleries ring a large central sunken living room where experiences and ideas are shared, playing a role similar to that of a town square. Hanging above is a stunning light reflecting lantern composed of glass ribs that appear to float beneath a large skylight. Not only a visual focal point, this crucial piece allows visitors in the sunken living room directly underneath a glimpse of the sky above while managing the trajectory of natural light entering the space. The surrounding galleries are further shaded from this natural light by a series of strategically aligned louvers acting as a ceiling. Galleries house a varied temporary exhibition program, as well as two long-term installations – highlights and changing exhibitions from the Neustadt Collection of Tiffany Glass, and From Watersheds to Faucets: The Marvel of the NYC Water Supply System, a partnership with the NYC Department of Environmental Protection. The Museum’s signature Panorama now enjoys a picture window entrance from the new atrium, and the new Shelley and Donald Rubin Gallery offers a space for collections to be exhibited, revealing not only the works of art, but the collector’s bent. Rounding out the first floor are a new Museum shop and café, adjacent to the Museum’s new front porch, and extended outdoor area with twelve crape myrtle trees and outdoor seating for museum-goers and park users alike, leading to a large lawn for passive recreation and outdoor programming. 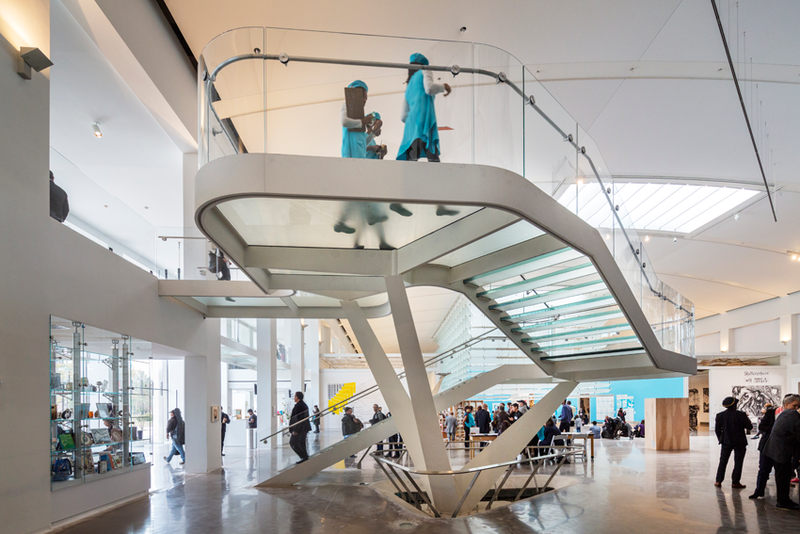 A fluid glass staircase that responds to the existing geometry of the building invites visitors to the second floor where gathering spaces overlooking both the park and galleries lead to the Museum’s new World’s Fair Visible Storage and Gallery, education workshop spaces, the Museum’s theater, Community Partnership Gallery and flexible event and gathering spaces. Also on the second floor are the administrative offices. A new ceremonial entry, visible from the adjacent Grand Central Parkway, beckons visitors to the site and serves as a gateway to the entire park beyond. This new west façade is marked by a sculptural metal entry canopy and a series of glass panels spanning the length of the building. This 220’ x 27’ glass façade, backlit by programmable LED lighting, serves not only as a beacon for the Museum, but also as a dynamic new canvas for commissioned works of art in the future. A final piece of the puzzle is the Museum’s new artist studio wing. Occupying the northern side of the Museum’s first floor, nine artists’ studios ranging in size from 350 to 700 sq. 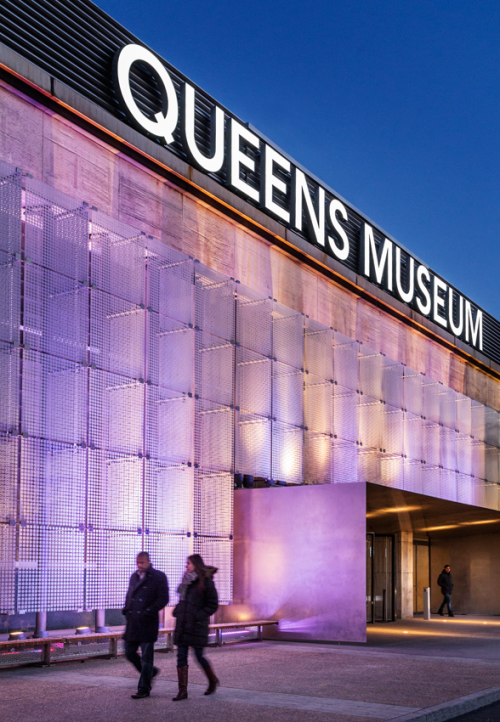 ft. are home base for the recently initiated Queens Museum Open A.I.R. Program (Artists in Residence). Today, the new Queens Museum is the marriage of form and function, where an expansive open light-filled space houses ambitious exhibitions, forward-thinking educational initiatives, and community-minded programming that engages myriad constituencies, be they local residents, international tourists, school children, artists, individuals with special needs, families, seniors, recent immigrants, and longtime New Yorkers.